To help mitigate some of the effects of ‘No Deal’ the UK has proposed to liberalise most MFN tariffs to zero. In order to comply with WTO rules, in a ‘No Deal’ scenario these new tariffs would apply to trade with the EU and with non-EU countries. The share of the UK’s imports that would be tariff-free under the Government’s proposed MFN tariffs, compared with the UK’s current situation, represents a substantial liberalisation with regard to non-EU imports. This would reduce the EU’s competitive advantage in exporting to the UK, and would encourage more imports from non-EU countries. However, it is not only tariffs that matter in driving trade flows. Proximity to the UK market, especially for perishable goods, may also be an important factor, as well as conformity with regulations. Once we take into account the share of UK trade with the EU, all of which is currently tariff-free, the change in tariffs will impact only a small proportion of UK imports. For exports, the changes are more substantial. Currently, 47% of our exports are with the EU, and these would almost certainly face higher tariffs in the event of ‘No Deal’. We find that the impact of the UK’s proposed policy in a ‘No Deal’ could lead to a decline in output of over 11%, and a decline in exports by more than 20%. These changes are greater than if the UK applied the EU’s MFN tariffs in a ‘No Deal’ Brexit. The proposed policy serves to increase the competitive pressure on UK firms / industries in the sectors that are being liberalised. While this is beneficial because it enables producers and consumers to purchase from relatively more efficient suppliers and may, therefore, mitigate some of the impact on consumer prices and intermediate costs, it also imposes costs on some UK firms which potentially reduce their output, profits and employment. On the 12th March 2019, and for the second time, the UK Parliament rejected the proposed Withdrawal Agreement which the UK Government had negotiated with the EU. The following day, the UK Government published a list of the tariffs it proposed the UK would implement in the event of a ‘No Deal’. On the 20th March, the UK Government wrote to the European Union requesting a short extension to the Brexit exit date, and a day later the European Commission confirmed that an extension until 22nd May could be possible, subject to the UK Parliament approving the Withdrawal Agreement (WA). However, there remains a distinct possibility that the WA will not be approved by Parliament and that the UK may, therefore, leave without a deal. a) explain carefully the Government’s proposals and identify how much of UK trade would be affected by the changes in tariffs in a ‘No Deal’ scenario; b) provide an empirical assessment of the scale of the economic challenge which could face UK industries in the event of ‘No Deal’. The aim is to inform the on-going and febrile political debate, because the economic consequences of the decisions taken do, and will, matter. As previous empirical studies have shown, we find that a ‘No Deal’ scenario results in significant challenges for many UK industries, leading to a potential decline in output of more than 10%. This occurs because of the change in the costs of trade with the EU, as well as with those countries that have existing Free Trade Agreements with the EU. The changes in the costs of trade are driven by changes in both tariff and non-tariff barriers. The increase in the costs of trade then impacts on UK imports with a rise in price for final consumers and producers who import intermediate goods, and also on UK producers as it becomes more expensive to sell abroad. We show that the impact on producers because of the rise in the costs of intermediates is significant. To help mitigate some of these effects, the approach adopted by the UK Government is to eliminate many of the existing tariffs currently being applied on non-EU trading partners. The aim is clearly to minimise the impact on the costs of importing. 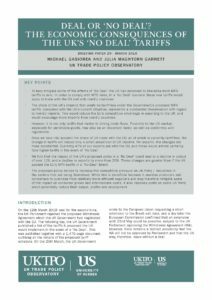 In order to ensure WTO compatibility, those tariffs would then also apply to the UK’s trade with the EU. While the majority of products would face zero tariffs under the Government’s proposal, for some products which might be deemed more sensitive (for example, food processing such as meat, ceramics, and vehicles) tariffs would be maintained. Once again, in a ‘No Deal’, these tariffs would apply to the UK‘s trade with both the EU and non-EU countries. In this Briefing Paper, we build upon our earlier blog ‘What should we make of the UK’s ‘No Deal’ tariffs?’ to explain carefully and exactly what the UK Government is proposing, and consider how much of the UK’s trade may be affected by these changes. Second, we apply these changes to a partial general equilibrium model of trade (TAPES), which includes 122 manufacturing and 10 agricultural sectors to identify the overall scale of the challenge implied by these changes. While the model of trade that we use is a partial equilibrium model, it builds on our earlier work by incorporating intermediate inputs as well as changes in input costs arising from changes in tariffs and non-tariff barriers. Before looking at the UK’s proposed tariffs in more detail it seems important to understand the situation the UK is currently in as a member of the EU. The EU’s Common Customs Tariff (CCT) ensures that all EU members apply the same tariffs. The tariff rates vary by product, and also depend on which country the imported product originates from. In addition to tariff-free trade between EU Member States, around 70 countries around the world have Free Trade Agreements (FTAs) in place with the EU, under which tariffs are largely (but not necessarily entirely) eliminated. Further, the EU gives preferential access to a number of developing countries through its Generalised Scheme of Preferences (GSP). Countries not party to any of these preferential arrangements face the EU’s Most Favoured Nation (MFN) tariffs. On the basis of the latest available data, in 2017, around 25% of UK’s imports came from countries that face these MFN tariffs, and, of these imports, around 40% were in products facing zero MFN tariffs. The Government’s MFN tariff proposal would see tariffs eliminated on around 95% of product lines (tariff lines), with only 469 products maintaining non-zero tariffs. Table 1 lists the more aggregate product groups where positive tariffs remain, and specifies the number of non-zero tariff lines that remain in each group. Meat products, textiles and automotive vehicles account for over 70% of the remaining non-zero tariff lines. Out of these 469 products where the Government is proposing to keep some tariffs, 56% maintain the EU’s current tariff rates. Conversely, under the UK’s proposal, 44% of the non-zero products have reduced tariff rates compared to the current EU level. This involves, for example, UK tariffs on pork, poultry meat and rice, which are, respectively, around 13%, 60% and 83% of the current EU tariffs on these products. Table 2 looks at the share of UK’s imports that would be tariff-free under the Government’s proposed MFN tariffs, compared with the UK’s current situation. Overall, around 92% of UK imports from non-EU countries would be tariff-free under the Government’s proposal. This compares with approximately 62% of imports currently. This, therefore, represents a substantial liberalisation with regard to non-EU imports. Roughly 81% of the UK’s imports from the EU would continue to be tariff-free under the proposed MFN tariffs. This is, of course, lower than the 100% of EU imports which are currently tariff-free, but it is still a substantially larger share than what would have been the case if the UK had mirrored the current EU MFN tariffs, where only around 32% of imports from the EU would have been tariff-free. Overall, our data indicates that around 86% of the UK’s total imports would be tariff-free under the Government’s proposal, similar to the Government’s figure of 87%. Compared to the current figure of around 82% of imports this is not a particularly large difference. However, if the UK had maintained the EU’s existing tariff schedule then only around 42% of UK imports, by value, would have been tariff-free in a ‘No Deal’ scenario. Maintaining the EU tariffs schedule in the event of a ‘No Deal’ would, therefore, result in a much more significant change in import costs for both final consumers and also for firms purchasing intermediate inputs. The UK Government is trying to mitigate this effect by eliminating tariffs on most products. However, in a ‘No Deal’ Brexit, the EU would apply its MFN tariffs on imports from the UK. While 100% of the UK’s exports are currently exported to the EU tariff-free, in a ‘No Deal’ scenario only around 40% of UK’s exports (by value) would be tariff-free. * These figures are approximate. They assume that, currently, 100% of imports from the current FTA countries are tariff-free, 50% of imports from GSP countries are tariff-free and 40% of imports from countries facing MFN tariffs arrive tariff-free. Source: Import data from HMRC for 2017, at the 8-digit level. In constructing the shares, any trade values not defined at the 8-digit level, or falling outside the HS 01-97 range, have been excluded as no tariff rates can be assigned to these values. With respect to imports from the EU, the aim thus appears to be to keep as much of this trade as possible tariff-free, such that there would be little change from the current situation. This, however, only applies to tariffs and quotas. These figures do not capture changes to non-tariff measures, or other barriers to trade, which could arise in the event of a ‘No Deal’ and would also impact on UK’s trade. With regard to trade with the rest of the world, the proposal involves more liberalisation, as the UK’s MFN tariffs would be lowered to zero (on a temporary one-year basis) on a range of products. However, as already noted, these tariff reductions largely only affect the (approximately 24) countries which the UK currently trades with on MFN terms. Some of these, such as the USA or China are, of course, important trading partners for the UK. In our earlier blog, we estimated that the simple un-weighted average UK MFN tariff would be around 0.7% under the Government’s proposals, significantly lower than the EU equivalent of 7.7%. To construct these approximate averages, where the UK maintains a specific rather than ad valorem tariff we used the EU’s AVE for that product and assumed that the change in the AVE is the same as that in the specific tariffs. With the same approach, but utilising the trade data, we can now also estimate the weighted average tariffs. Overall, we estimate that the UK’s weighted average tariff under the Government’s proposal would be around 1.6%, compared with 4.5% if the UK applied the EU’s MFN tariffs. Looking only at the UK’s trade with the EU would give a weighted average tariff of 2.1% compared with an average of 1% for the UK’s trade with non-EU countries. Next, we explore in more detail where some of the big changes in tariffs will be under the Government’s proposed tariff schedule compared with the tariffs that the UK levies currently. Table 3 is based on those products where the UK Government proposes to fully eliminate tariffs, and thus does not take into account the products where non-zero tariffs will remain. Of these tariff-free products, the ten products with the highest, current, EU MFN tariffs (including AVEs) have been listed. It shows that exporters to the UK (or to the EU) of HS 0404 (‘whey products’), from countries currently facing the EU’s MFN tariffs, faced an average EU MFN tariff equivalent to 157% in 2017. This would be tariff-free under the Government’s proposal. The fourth column in the table gives each product group’s share in total UK imports, and the final two columns give the share of these imports that come from the EU and the ‘MFN group’, defined as those countries currently trading on WTO terms with the UK. Hence, if we take whey products we see that these account for 0.02% of total UK imports and that 99.5% of UK imports come from the EU. It is not surprising that the MFN group is supplying a very small share of these products while the EU is supplying a large share. The EU has a competitive advantage in good part because it can export these products duty-free to the UK whereas MFN suppliers face considerable tariffs, as seen in column three. Eliminating tariffs on these products for all suppliers would diminish the EU’s competitive advantage somewhat, and may, therefore, encourage more imports from the MFN group. However, it is important to note that it is not only tariffs that matter in driving these trade flows. Many of these products are perishable goods and proximity to the UK market is, therefore, an important factor, giving EU countries a continued advantage over countries further afield. In addition, as members of the Single Market, EU member countries have significantly lower regulatory barriers to trade between themselves. A ‘No Deal’ exit from the EU will also raise those bilateral barriers. Source: EU tariff data from UNCTAD TRAINS, trade data from UN Comtrade all downloaded from WITS for the year 2017. Tariff averages are simple unweighted averages based on the 8-digit level. While suppliers trading on WTO terms would see a reduction in the tariffs they face in the UK market, exporters from the EU, and to some extent, the current FTA countries, will see UK tariffs rise in some products. In Table 4 we now focus on the products which will continue to face non-zero tariffs. The table lists the five product groups with the highest imports (by value) from the EU out of the products facing non-zero UK tariffs. Looking at the top product group, HS 8703 – Motor cars, this accounts for 6.9% of the UK’s total imports, of which 87% come from the EU. While all of these EU imports would currently be imported duty free, almost all of these imports would face tariffs of 10% in a ‘No Deal’ scenario. Similarly, the final row shows that 96.2% of UK’s imports of HS 0207 – Meat and edible offal of poultry, came from the EU and 98.8% of these imports would face new tariffs in the event of a ‘No Deal’. Source: Trade data from HMRC for 2017. The average tariff is calculated based on the non-zero product codes within each group. Where specific tariffs are levied, the EU’s 2017 ad valorem equivalent tariff has been used and we have assumed that the change in the AVE is the same as that in the specific tariffs. So far, we have focused on the UK’s imports, but it is also the case that in the event of no-deal this will impact on UK exports to the EU. Turning to UK exports the changes, not surprisingly, impact on a more substantial amount of trade. Currently, 47% of UK’s exports are with the EU, and these would almost certainly face higher tariffs on trade with the EU in the event of ‘No Deal’. We explore this in more detail in the next section. In this part of the paper, we provide some simulations of the impact of the changes in tariffs implied by the UK’s proposed tariff schedules on output, trade and welfare. The underlying model is a ‘partial general equilibrium’ model of trade, and some of the main features of the model are described in more detail in an earlier UKTPO Briefing Paper. This analysis builds on that earlier model in two ways. First, we now have 10 agricultural sectors, whereas previously we focused entirely on manufacturing. Secondly, and importantly, we now include intermediate input linkages for each of the sectors that we model. Hence, in considering changes in either tariffs or non-tariff barriers to trade we also take into account the impact this may have on intermediate costs within each industry. For comparative purposes, we run two sets of simulations, and the results of these are summarised in the table below. In the first two columns, we assess the aggregate implications for the 132 sectors in the model if the UK adopted the EU’s MFN tariff schedule in a ‘No Deal’. In the second set of two columns, we assess and compare those results with the consequences of the Government adopting its proposed tariffs in a ‘No Deal’. With regard to each of these, we want to assess the importance to the UK economy of its engagement in international supply chains and hence, we run each of our simulations to incorporate the changes in intermediate input costs and where we suppress those changes. The changes in intermediate costs may arise from a change in either tariffs on imports of intermediates or changes in non-tariff barriers to trade. It is important to understand what is and is not included in our simulations. In each of the simulations given below, we change both tariffs and non-tariff barriers to trade. This is because leaving the EU with ‘No Deal’ will impact on both of these aspects. Hence, leaving the EU will increase the non-tariff barriers to trade between the EU and the UK. As in our earlier Briefing Paper, these changes in non-tariff trade costs are based on the sectoral estimates in the work of Cadot and Gourdon. In our previous work, we also assumed that leaving the EU would increase border-related costs of trade by a (conservative) ad valorem equivalent of 3.5%. For the simulations provided here, we have assumed that this cost will apply to UK exporters on the assumption that EU customs authorities will apply additional checks, but following the Government’s announcement with regard to simplified import procedures we have not applied this additional cost to UK importers. The first column of Table 5 evaluates the impact of adopting the EU’s MFN schedule in the event of a ‘No Deal’, but where the additional impact on intermediate input costs has not been accounted for. Here we see that the aggregate impact on the UK, by summing over all the sectors, is a decline in output of 5.5%, and exports and imports go down by up to 17% and 6% respectively. In the second column of the table, we allow for the tariff and non-tariff barrier changes to impact on intermediate costs. This increases the negative impact on the UK economy with output declining by a further 3%. This is important because it reflects the extent of the integration of UK industries into EU and non-EU supply chains. In the table, we also outline the impact of these changes on the EU. What is clear is that the impact on the EU is also negative but it is much smaller. It is, therefore, simply incorrect to argue that because the UK imports more from the EU than it exports to the EU, that the EU would worry more about a ‘No Deal’ outcome. This is driven by the underlying trade flows whereby the share of the EU in the UK’s trade is much more substantial than the share of the UK in the trade of the EU. The final two columns of the table compare these outcomes to the UK government’s ‘No Deal’ tariff proposals. We see that this proposal results in a bigger negative impact on output and exports for the UK, and a smaller decline in imports. The bigger impact on output arises because of the decline in protection for more industries as a result of the more widespread lowering of UK MFN tariffs to zero. This exposes more industries to competition from abroad. The simulated decline in output is now nearly 12%, and the decline in exports is more than 20%. These are substantial changes. It is important to stress two aspects here. First, trade liberalisation is typically good for an economy in that it enables producers and consumers to purchase from relatively more efficient suppliers. Part of the changes in trade are also undoing some of the preferential access to the UK market which EU firms previously had. Nevertheless, trade liberalisation can impact negatively on previously protected producers and when the changes in policy are large (as would be the case with a no-deal Brexit) the potential consequence will be more substantial. Second, we would underline that these are not predictions as to what will happen in the event of a ‘No Deal’ Brexit. We are only capturing some of the elements of a ‘No Deal’ and in a stylised, and imperfect, fashion. For example, we are not capturing any changes to the costs of services trade, or longer-term impacts on investment or labour mobility, all of which are important elements to consider. Neither are we capturing any other policy responses or other changes (such as anti-dumping duties) which may occur. However, and to paraphrase Keynes, while these numbers may be ‘precisely wrong’, they should be seen as ‘roughly right’ in that they capture the challenges (or vulnerabilities) of UK industries to tariff and non-tariff barrier changes. In this Briefing Paper, we evaluate the extent and consequences of the UK government’s ‘No Deal’ tariff proposals. We find that under the Government’s proposal 92% of UK’s imports from non-EU countries would be tariff free, a substantial increase from roughly 62% currently. In contrast, 19% of the UK’s imports from the EU will face new tariffs under the proposal. First, a ‘No Deal’ Brexit will pose a significant challenge to the UK economy with a negative impact on output, exports and imports driven largely by the increased cost of trading with the EU. Second, pursuing a more liberal policy with regard to tariffs on UK imports may serve to increase the negative impact on the UK’s output. This is driven by the increased competitive pressure on UK firms / industries in the sectors that are being liberalised. Hence, while the policy may mitigate the impact of Brexit consumer prices and intermediate costs, it also exposes UK firms to more competition. However, this does not mean that the policy is necessarily misguided. As well as the direct comparative advantage gains from lowering tariffs, there is also a large empirical literature suggesting that trade liberalisation, through various channels, can lead to higher productivity growth. Finally, these results highlight that in the event of ‘No Deal’ the Government’s room for policy manoeuvre is somewhat limited. While it can lower the UK’s import tariff, it cannot impact on the tariffs UK firms will face on exports, nor can it do much to resolve the potential increase in regulatory barriers to trade. Moreover, if the Government chooses to lower tariffs in the event of a ‘No Deal’, even on a temporary basis, this may make negotiation of free trade agreements with future partners more difficult. This was published together with a 1,478 page document outlining all the details of the proposed tariff schedule. At the time of writing, the countries where continuity agreements have been signed are Chile, Faroe Islands, Israel, Switzerland, Palestinian Territory, Madagascar, Mauritius, Seychelles, Zimbabwe, Fiji and Papua New Guinea. A continuity agreement with Norway and Iceland has been initialled which, if signed, would increase the share to around 3.6%. See Gasiorek, M., Serwicka, I., & Smith, M.A.M. (2019), “Which manufacturing industries and sectors are most vulnerable to Brexit”, World Economy. The share of trade that this group accounted for is slightly higher if Japan is included. The EU-Japan agreement entered into force in February 2019. This is based on the 8-digit Combined Nomenclature, where there are around 9,500 tariff lines in total. The figure of 62% treats Japan as an ‘FTA country’ where all imports from Japan are assumed to be tariff free. Treating Japan as an ‘MFN country’ would reduce the tariff free share to around 59%. In our calculations we have excluded any trade values not defined at the 8-digit level, or falling outside the HS 01-97 range, since no precise tariff rates can be assigned to these values. Applying zero tariffs to these trade values would give a total share of 87% tariff free, the same as the Government’s figure. For example, if a UK specific tariff is half the size of the current EU tariff, then the UK is assumed to have an AVE equal to half of EU’s AVE for this product. For the EU we use tariff data from UNCTAD TRAINS for 2017, including AVEs. The calculations are done at the 8-digit level, where tariffs for the EU have been aggregated from the more detailed 10-digit level. Calculating the average at the 8-digit level can yield higher results than if this is done based on less disaggregated tariff lines. Using the HS 6-digit level would give a simple average EU MFN tariff of 5.61 and a weighted average of 3.13.